The Sabin Community Orchard (SCOrch) is located on a sloped public right-of-way at NE Mason Street between NE 18th and 19th Avenues. 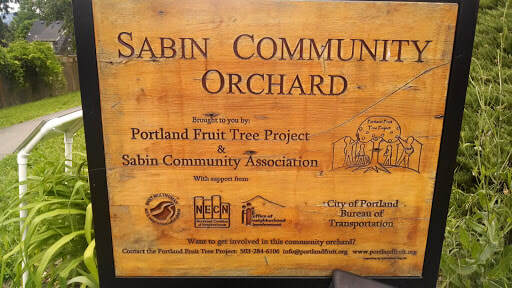 SCOrch was established in February 2010 as a collaborative partnership between Portland Fruit Tree Project and Sabin Community Association. The volunteer-maintained orchard is now home to 20 fruit trees and dozens of edible understory plants. SCOrch stewards and volunteers gather for monthly work-and-learn sessions to perform orchard maintenance, including weeding, pruning, shoring up paths, and more. We're always looking for new faces, so please check out the upcoming work-and-learn sessions below! April 21: (Easter): Earth Week event, pollinators, Easter egg hunt! Nov. 17: Putting SCOrch to bed. Feel free to check in with us at sabinorchard (at) gmailcom, or with Jeff Strang, co-founder and chief steward, at 503-282-3647.